"This storage bed has a wooden frame that's covered in a tufted linen exterior, making it a great addition to a modern home." "An affordable option that comes in both twin and full sizes, providing an impressive amount of additional storage for small bedrooms." "This fully upholstered product features four spacious storage drawers, allowing you to store lots of items out of sight." "This bed includes a high bed frame with two large drawers underneath." "Has a mechanism that allows you to easily lift up the mattress, revealing a storage compartment that takes up the whole space under it." "Comes with four spacious under-bed drawers, allowing you to stash a wide variety of items out of sight." 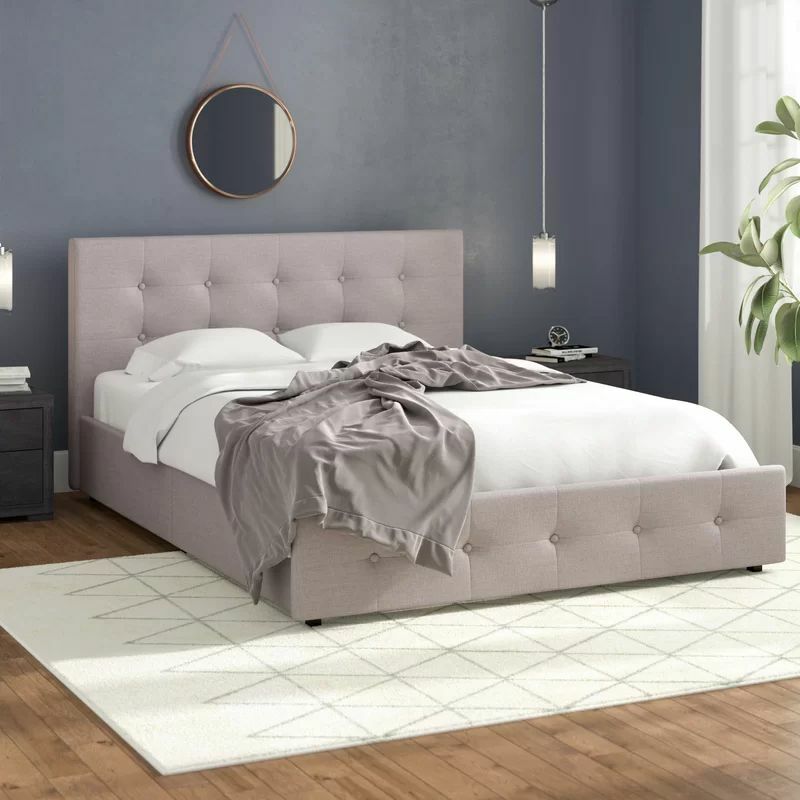 "This upholstered bed frame features a modern button tufted headboard and an upholstered base...and two hidden drawers." "Comes in several colors and boasts ample storage for your little one’s bedroom." Winston Porter Houchins Upholstered Storage Platform Bed is a high-quality, stylish, and affordable piece of furniture that would make a stunning addition to any bedroom. This upholstered bed frame comes in twin, full, queen, and king sizes, and it gets top marks from hundreds of reviewers. This storage bed has a wooden frame that's covered in a tufted linen exterior, making it a great addition to a modern home. It includes a slat kit to hold up your mattress, and the base of the bed contains four hidden drawers where you can store linens, blankets and more. According to reviewers, this bed is made from high-quality materials and can be put together in a few hours. Many people note it provides an impressive amount of storage, but several warn that the color of the fabric is darker than it appears in the online photograph. Bed frames, especially those with built-in storage, can get quite expensive, but you don't have to drain your bank account to get a quality storage bed. The DHP Maven Platform Bed is an affordable option that comes in both twin and full sizes, providing an impressive amount of additional storage for small bedrooms. This bed has a simplistic design featuring just a sleek base—no headboard. It includes a slat system to hold up your mattress, and each side has a large drawer where you can tuck away additional belongings. Reviewers say this product is an unbeatable value, as it's made from high-quality materials and looks beautiful. The only downsides noted are that the bed can be a little challenging to put together and its drawers roll on the floor, not a track. If you would like a stunning storage bed from a top furniture brand, look no further than the Pottery Barn Upholstered Storage Platform Bed, which comes in a variety of sizes and numerous fabric options. While significantly more expensive than other options, this bed is made with unparalleled craftsmanship and will serve your family well for years to come. This product is just a bed base—no headboard—and it comes in full, queen, king or California king sizes. The fully upholstered product features four spacious storage drawers, allowing you to store lots of items out of sight. It includes adjustable leg levelers for stability uneven floors, and you also get a slat system to support your mattress. What's wonderful about this product is that you can choose from a wide selection of colors and fabrics, from linen to velvet and suede, finding the perfect bed to match your headboard. However, keep in mind that certain made-to-order options are more expensive and take longer to be delivered. Looking for a twin storage bed for your child or guest room? Then the MALM bed from Ikea will certainly fit the bill! This twin size storage bed has the simple modern design Ikea is known for, allowing it to match perfectly with just about any decor style. This bed includes a high bed frame with two large drawers underneath. The storage drawers roll smoothly on casters (ensuring they're easy to pull out), and the bed even features adjustable sides to accommodate mattresses of different thickness. Reviewers say this is a great storage bed for children, writing that it is sturdy and has lots of room for storage. The DHP Cambridge Upholstered Faux Leather Platform Bed doesn’t have the usual under-bed drawers. Instead, the bed has a mechanism that allows you to easily lift up the mattress, revealing a storage compartment that takes up the whole space under it. This storage bed has a tufted faux leather finish that will look great in a modern-style bedroom. From the outside, it looks like a standard bed, but there’s a handle at the foot of the bed that allows you to effortlessly lift up the mattress to access to hidden storage space underneath. It’s a great solution if you want the most possible storage space and don’t mind sacrificing the organizational benefits of drawers. Reviewers say assembly of this bed is a bit time consuming, as there are many pieces, but once it’s together, the product is high quality, comfortable, and easy to open and close, not to mention that it provides tons of additional storage. As you might expect, larger beds generally have more room for storage. The queen sized Greyleigh Kerens Upholstered Storage Panel Bed comes with four spacious under-bed drawers, allowing you to stash a wide variety of items out of sight. This lovely bed has a tufted gray headboard and nail-head trim, as well as an upholstered base. There are four deep drawers on metal slides underneath the bed—two at the foot and one on each side. A slat system is included, but note that you must use a boxspring with this bed. In addition to being beautiful, this storage bed has more than 700 five-star reviews. Many note it is complicated to put together, but reviewers agree the bed is sturdy and well made. Plus, the drawers are bigger than expected, accommodating even the bulkiest linens. Looking for a storage bed to accommodate your king size mattress? The Latitude Run Alejo Upholstered Storage Platform Bed is a highly-rated option that has the tufted headboard style so many people love. Plus, it's surprisingly affordable even though it's a king. This upholstered bed frame features a modern button tufted headboard and an upholstered base. There are two hidden drawers where you can stash various belongings out of sight, and the bed comes with a slat system to support your mattress—no box spring required. It may take a few hours to assemble this bed, the reviewers say that once it's together, it's an absolutely stunning focal point for the bedroom. If you’re searching for a storage bed for your children, you should definitely look into the Savannah Twin Mate’s & Captain’s Bed, which comes in several colors and boasts ample storage for your little one’s bedroom. This wooden bed has three drawers tucked away in the base, allowing you to store extra items in your children's bedroom. This product is only the base of the bed, but you can attach a headboard to either end, ensuring you can set the room up as needed. The corners of the bed or rounded for your kid’s safety, and the drawers are on metal gliders so they open and close easily. Reviewers say this bed is sturdy and quite attractive, making it a great purchase for children. However, several reviews express disappointment that the headboard pictured in the images is not included—you have to purchase that separately, if desired. Our writers spent 2 hours researching the most popular storage beds on the market. Before making their final recommendations, they considered 18 different beds overall, screened options from 16 different brands and manufacturers and read over 25 user reviews (both positive and negative). All of this research adds up to recommendations you can trust.